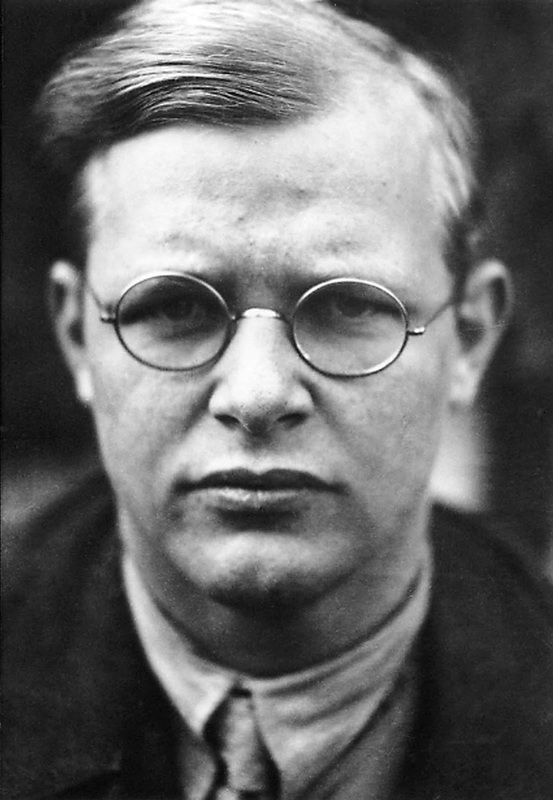 Bonhoeffer’s books (e.g. Letters from Prison, Cost of Discipleship, Ethics, Essays from Gen 1-3) are becoming increasingly popular among Christians today. In some ways he sounds like an man of exemplary faith. He believes the law of God should be obeyed. He believes Christians should transform culture. He believes Christianity is not just a private affair of our heart, as did many Germans of his day and Americans of our day; he understood we have to be Christians in the marketplace and not just on Sunday morning. Hence his denunciation of religion (i.e. Christianity) that was only an inner religion. However his Christianity is not the Christianity of the Bible. He is a liberal – in the technical theological sense of the word. That means he uses the same words as Biblical Christians, but means something very different by them. Because he uses the same words, at times he can sound very orthodox. But as one can see from what he says below, he is anything but orthodox. It is not some religious act that makes a Christian what he is, but participation in the suffering of God in the life of the world. We might agree that is it not some religious act that makes man a Christian. And we might agree that as Christians we suffer in this world even as Christ did. But we have to vehemently disagree that our sufferings do anything to merit our salvation or in any way are the basis of our salvation. There are a number of martyrs that have died for good causes that won’t be in heaven. I have often wondered how the Evangelist came to record this prayer, which nobody can have heard. The suggestion that it must have been revealed by Jesus during the great forty days is only a subterfuge. Have you any explanation to offer? My view of it today would be not that he went too far, as most people seem to think, but that he did not go far enough. It is not only the mythological conceptions, such as the miracles, the ascension and the like (which are not in principle separable from the conceptions of God, faith, and so on) that are problematic, but the “religious” conceptions themselves. You cannot as Bultmann imagines, separate God and miracles, but you do have to be able to “interpret” and proclaim both of them in a “non-religious” sense. Bultmann would seem to have felt Barth’s limitations in some way, but he misconstrues them in the light of liberal theology, and hence goes off into the typical liberal reduction process (the ‘mythological’ elements of Christianity are dropped and Christianity is reduced to its ‘essence’). I am of the view that the full content, including the mythological concepts, must be maintained. Positivism of revelation is his language for the Christian and Biblical doctrine that the Scriptures are the word of God. They do not merely contain truth that we have to separate from myth. They are not myths that somehow communicate a “truth.” They are not merely the words of men, but revelation “breathed out” (2 Tim 3:16) by God himself. I think it almost goes without saying that to call the resurrection a myth is to deny Christ and make the gospel meaningless. To resume our reflections on the Old Testament. Unlike the other Oriental religions, the faith of the Old Testament is not a religion of salvation. There is no longer any need for God as a working hypothesis, whether in morals, politics, or science. Nor is there any need for such a God in religion or philosophy. In the name of intellectual honesty these working hypotheses should be dropped or dispensed with as far as possible. But if I only knew the way. There isn’t any such way, at any rate not at the cost of deliberately abandoning our intellectual sincerity. The only way is that of Matthew 18:3, i.e. through repentance, through ultimate honesty. And the only way to be honest is to recognize that we have to live in the world etsi deus daretur. And this is just what we do see – before God! So our coming of age forces us to a true recognition of our situation vis a vis God. God is teaching us that we must live as men who can get along very well without him. The God who is with us is the God who forsakes us (Mark 15:34). The God who makes us live in this world without using him as the working hypotheses is the God before whom we are ever standing. Before God and with him we live without God. God allows himself to be edged out of this world and on to the cross. God is weak and powerless in the world, and that is exactly the way, the only way, in which he can be with us and help us. Matthew 8:17 makes it crystal clear that it is not by his omnipotence that Christ helps us, but by his weakness and suffering. This is the decisive difference between Christianity and all religions. Man’s religiosity makes him look in his distress to the power of God in the world; he uses him as a Deus ex machina. The Bible however directs him to the powerlessness and suffering of God; only a suffering God can help. To this extent we may say that the process we have described by which the world came of age was an abandonment of the false conception of God, and a clearing of the decks for the God of the Bible, who conquers power and space in the world by his weakness. This must be the starting point for our “worldly” interpretation. His view of Scripture is also closely aligned with classic liberalism. In a book recently translated into English he rejects the Biblical idea that the Scriptures are the Word of God, the self revelation of Jesus Christ, the Son of God who became flesh and dwelt among us, suggesting instead that we must glean what truth we can from a fragile and broken book. As illustrated by the form of the Bible, this procedure means that the concept of the canon must he rejected as meaningless. Text criticism and source analysis are applied, sources are identified, form criticism and history-of-religions approaches fragment the text into its smallest units. After thoroughly reducing the text to rubble, the critics depart from the battlefield, leaving behind debris and shavings, their work apparently done. In terms of its content, the biblical picture is smoothed out to correspond to the spirit of its time, miracle stories are paralleled, and yes, even the person of Jesus himself is stripped not only of his divine but of his human splendor and disappears without any distinguishing marks into the lists of rabbis, sages, and religious enthusiasts. Of course, the reflective historian will also recognize that this book deals with particularly strange and profound things, that one catches sight of figures of outstanding magnitude, and so forth—otherwise he would surely he a poor historian. But he would be no better a historian if he believed that with such observations he could show that the Bible is the word of God. There is no historical access to the person of Jesus that would be obligatory for faith. Access to the historical Jesus must come by way of the Resurrected One, by way of the word of the resurrected Christ, who testifies to himself. It is the Risen One who himself creates faith and opens up access to historicity. From this point of view, the historian’s word, whether it claims to affirm or deny Christ, is irrelevant. In faith, history is seen to be what it actually is from the point of view of eternity, not in terms of itself, from within. At the same time it must he maintained that the testimony of Jesus as the Risen One is nothing else than what is presented to us by the Bible. We remain also clear headed and objective as believers. We must read this book of hooks with all human methods. But through the fragile and broken Bible, God meets us in the voice of the Risen One. His death at the hands of Hitler has been called a martyrdom. But I think from the few quotes above, taken from letters written in the last year of his life, it is clear he is not a martyr for the gospel. Many people heap praise on him for his courage and leadership; but many people also heap praise on Dr. Tiller, a prolific murderer of babies murdered by a less prolific murderer. One comment from a NYT article on him at his assassination serves as a representative example. Mahatma Gandhi, Mother Teresa, and Albert Switzer are other examples of people who, though they were outside of Christ, captivated many hearts by their selfless dedication to humanitarian causes. This is classic liberal doublespeak!